Flaunt in style with the brand new Micromax Canvas P650 tablet. Its sleek, all aluminum body, eye stunner with all the advanced features and classic looks. The tab also supports a SIM so you can talk your heart out with friends and family. Witness all the action on a 20.3 cm ( 8 inch) large IPS capacitative display screen. It has 5 point multi-touch screen hence go touching and exploring everything you wish to on your tablet. It is a sheer pleasure looking at videos or movies or reading texts, emails and books on this tablet as it has the ability to display 16 million color screen. 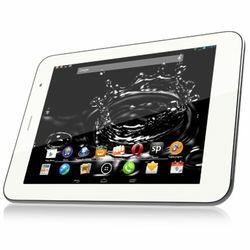 All the infotainment comes to life on this tablet because of its robust Android 4.2 Jelly Bean Operating System. It has a rich multimedia technology and a streamlined user interface making it easy for the users to navigate through the apps and manage all the content on the phone. Seamless multi-tasking and fantastic gaming experience is now possible on Micromax Canvas P650 tablet. It has the super fast 1.2 GHz Quad Core processor with 1 GB RAM so that you can explore the whole new world of infotainment on your Canvas Tab. The tab keeps you connected no matter where you are! You can connect to high speed internet via Wi-Fi and 3G connection. It also has a Bluetooth 3.0 and a Micro USB that helps you to connect your device with the other devices easily. So now you download app or play games by importing it from your PC on this tablet. Canvas P650 tab comes with a wide range of pre-loaded apps that can whet your appetite for information and edutainment. These apps include Spuul, Opera, Kingsoft Office, M!Security, M!Live. For all the music lovers this tab is surely a must have as it has an app called Music Hub which gives you an access to over 500,000 songs. The 5 MP camera in the tab allows you to experience everything in rich detail. The camera also has a 4X zoom so you can click and view every picture and video in superb clarity. Have fun video chatting with 2 MP front facing camera on this tab. Canvas tab comes with super powerful 4800 mAh battery power so that you can carry on doing everything that you wish to for a longer period of time. Also you can stack all your important content on the tab with its 16 GB internal memory that is expandable up to 32 GB. Have double fun by pinning your browser or video on half of the screen of the tablet while you're working on another app on the other half of the tablet. This tablet is highly intuitive and knows when you're looking away from the screen. If you look away the tab will know it and pause the video automatically when you are not looking at the screen. Hence, while you are watching a video you won't miss a second. Flaunt in style with the brand new Micromax Canvas P650 tablet. Its sleek, all aluminum body, eye stunner with all the advanced features and classic looks. The tab also supports a SIM so you can talk your heart out with friends and family. Display Witness all the action on a 20.3 cm ( 8 inch) large IPS capacitative display screen. It has 5 point multi-touch screen hence go touching and exploring everything you wish to on your tablet. It is a sheer pleasure looking at videos or movies or reading texts, emails and books on this tablet as it has the ability to display 16 million color screen. Operating System and Processor All the infotainment comes to life on this tablet because of its robust Android 4.2 Jelly Bean Operating System. It has a rich multimedia technology and a streamlined user interface making it easy for the users to navigate through the apps and manage all the content on the phone. Seamless multi-tasking and fantastic gaming experience is now possible on Micromax Canvas P650 tablet. It has the super fast 1.2 GHz Quad Core processor with 1 GB RAM so that you can explore the whole new world of infotainment on your Canvas Tab. Connectivity and Multimedia The tab keeps you connected no matter where you are! You can connect to high speed internet via Wi-Fi and 3G connection. It also has a Bluetooth 3.0 and a Micro USB that helps you to connect your device with the other devices easily. So now you download app or play games by importing it from your PC on this tablet. Canvas P650 tab comes with a wide range of pre-loaded apps that can whet your appetite for information and edutainment. These apps include Spuul, Opera, Kingsoft Office, M!Security, M!Live. For all the music lovers this tab is surely a must have as it has an app called Music Hub which gives you an access to over 500,000 songs. Camera The 5 MP camera in the tab allows you to experience everything in rich detail. The camera also has a 4X zoom so you can click and view every picture and video in superb clarity. Have fun video chatting with 2 MP front facing camera on this tab. Battery and Memory Canvas tab comes with super powerful 4800 mAh battery power so that you can carry on doing everything that you wish to for a longer period of time. Also you can stack all your important content on the tab with its 16 GB internal memory that is expandable up to 32 GB. Additional Features Video/Browser Pinning Have double fun by pinning your browser or video on half of the screen of the tablet while you're working on another app on the other half of the tablet. Look Away To Pause This tablet is highly intuitive and knows when you're looking away from the screen. If you look away the tab will know it and pause the video automatically when you are not looking at the screen. Hence, while you are watching a video you won't miss a second.